Strategy Points for Traders of Genoa Board Game. 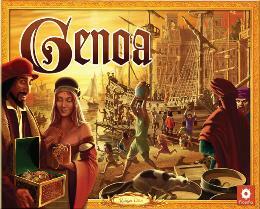 Genoa (or the older title “Traders of Genoa”) is about negotiating every step of the game - literally. You are going to get fatigued near the end, but just keep going. Make every turn count. This is a trading game. It’s better to trade with your opponents then not, as long as you trade the most often (spreading the trade amongst the players). Get a least one action per turn and with the use of special cards you can gain more actions. Watch the cost of obtaining items. You need to be profitable. It is hard to figure out the value for each action, but all of the action to complete cards should be 50% or less of the face value. If people are not giving money for a tower move that would net them a lot, don’t move it. Don’t be goal fixated. Be flexible and opportunistic. Collect all of the different items on the cheap and then do some combinations to get money. You should be thinking to yourself "how can I make money this turn?" This is the biggest tip I can give you for this game. It sets your mindset for the Genoa Board Game. In the older instructions of Traders of Genoa, they give you an example of what “Anna” does. She does crazy combinations with her cards. Be like Anna. Unlike some games, you need to do it all. You can’t neglect Privilege or messages or orders. Ignoring one of these components reduces the flexibility to gain more money. Acquire buildings where you can. This will help collect money and make the “Use Building” special cards very useful. Try to claim the cathedral since this is a popular building. You will also discourage others since they have to give you $10 to use the building. Don’t forget you can trade (from players or using the 1:1 card) for owner markers. This is helpful if you just can’t win the cathedral space. Try trading goods instead of money for moving the tower. As a Genoa tower player, try to get cash, as the non-tower person, give goods. In the end, Traders of Genoa, you have to have the endurance and the will to go the distance. Every move of the tower needs to be negotiated. You need to be “Rocky”. You should feel exhausted after playing this game. Enjoy!